China’s statement on Tuesday that it would soon start building infrastructure on its artificial islands in the South China Sea drew condemnation from the Philippines, Japan and the United States on Wednesday. Manila said it was considering asking the United Nations arbitral tribunal to issue a provisional measure to stop Beijing from pursuing its expansion into disputed parts of the South China Sea. Recent satellite images showed land reclamation on Kagitingan (Fiery Cross), Calderon (Cuarteron), Burgos (Gaven), Mabini (Johnson South), Panganiban (Mischief), Zamora (Subi) and McKennan (Hughes) reefs in the West Philippine Sea, South China Sea waters within the Philippines’ 370-kilometer exclusive economic zone. With its massive and rapid building of artificial islands and infrastructure on those reefs, China has “illegally occupied” the Philippines, Chester Cabalza, a Filipino security expert, said on Wednesday. 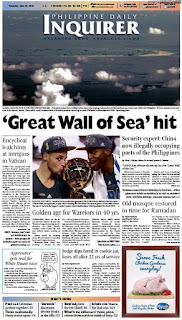 “It has effectively put up its own Great Wall of the Sea,” Cabalza added. “They are occupying our territory rapidly because they have a timeline that they need to meet. This is already an illegal occupation by China through their construction of infrastructure and as a result, we lose a lot of our resources,” Cabalza, a professor at the National Defense College of the Philippines, told the Inquirer on the phone. Cabalza said that by building artificial islands in the South China Sea, China was now carrying out its Anti-Access Area Denial (A2/AD) strategy, a military doctrine used to deny foreign militaries access to a certain area. By using A2/AD, China is denying other militaries access to the South China Sea and impinging on other countries’ freedom of navigation, he said. “The more China blocks access to the South China Sea, [the more power it gets] in the region, as [it controls] the area,” Cabalza said. Washington said it was aware that China intended to complete some reclamation work in the South China Sea in the coming days, but Beijing’s plans for further construction work would not ease tensions in the heavily disputed sea. China announced on Tuesday that it would soon complete some of its land reclamation on reefs in the Spratly Islands in the middle of the South China Sea and follow up with building infrastructure to carry out functions ranging from maritime search and rescue to environmental conservation and scientific research. The announcement indicates China’s intention to seal its claim to almost the entire South China Sea ahead of a ruling from the UN arbitral tribunal on a Philippine challenge to that claim filed in 2013. On Monday, Senior Associate Justice Antonio Carpio of the Supreme Court urged the government to ask the international court to stop China’s land reclamation. Jose explained that the government considered it premature to file a request for a provisional measure because the arbitral court had yet to determine whether it had jurisdiction over the Philippine case. The UN court has scheduled oral arguments for July 7 to 13 after which it will decide on jurisdiction and admissibility of the Philippine case, Jose said. China has spurned the proceedings, insisting it has “undisputed sovereignty” over the South China Sea, but has been ordered by the tribunal to comment on the Philippine case just the same. Jose added that the government was confident the five-member court headed by Judge Thomas A. Mensah of Ghana would rule in favor of the Philippines. Jose said China’s land reclamation in the South China Sea had become a concern not just for the Philippines but the international community as well. Besides the Philippines, Brunei, Malaysia, Vietnam and Taiwan have claims that overlap with China’s in the South China Sea, a vital waterway where $5 trillion in global cargo passes every year. Malacañang said the government would continue pursuing a resolution of the territorial dispute with China in accordance with international law, but the Department of National Defense (DND) said the Philippines should intensify its efforts to put international pressure on China. Peter Paul Galvez, spokesman for the DND, said there was no indication that China would stop building artificial islands and infrastructure in the South China Sea. “I think we just need some more [pressure]. We just have to continue . . . informing . . . the international community [about] what’s happening,” Galvez said. “Let’s not discount the value of informing and telling people, making them understand what’s really happening, because we need to counter the lies behind these claims,” he said. Galvez said the DND was pleased with the strong support of the United States, European Union, Group of Seven, Australia and Japan. “That should be enough for [China] to realize that what [it is] doing is really contrary to international law. So we call on [China]: Come on, wake up to the truth,” he said. Galvez said the airstrip that China was building on Kagitingan Reef was 75-percent complete. He said the airstrip was big enough to receive large cargo and military aircraft. At the DFA, Jose said the government had launched a massive information campaign to inform the public on developments in the South China Sea. On Friday, the DFA released a 20-minute documentary film, “Karapatan sa Karagatan” (Maritime Rights), dealing with the economic losses that the Philippines incurs due to the territorial dispute with China. The documentary, hosted by Lourd de Veyra and Jun Sabayton and directed by RA Rivera, was aired by PTV 4. It was the first of a four-part series on the West Philippine Sea. The DFA, however, is not supporting any campaign for a boycott of Chinese goods, Jose said. Filipinos in the United States last week called for a boycott of Chinese goods to pressure China into giving up its claim to Philippine territory in the South China Sea. The United States has called for an “immediate and lasting” halt to China’s island-building in the South China Sea. On Tuesday, Washington said it “noted” Beijing’s announcement of the completion of some land reclamation work, but expressed concern that its plans for more construction work, including for defense, would not ease tensions in the region.